Hermann Heinrich Hebbeler was born Jan 25th, 1799 in Schledehausen, son of Conrad Heinrich Hebbeler and Anna Maria Probst. Anna Marie Gertrud Niemann was born May 30th, 1803 in Grambergen, daughter of Bals Heinrich Westrup Col. Niemann and Anna Gertrud Dörmann. 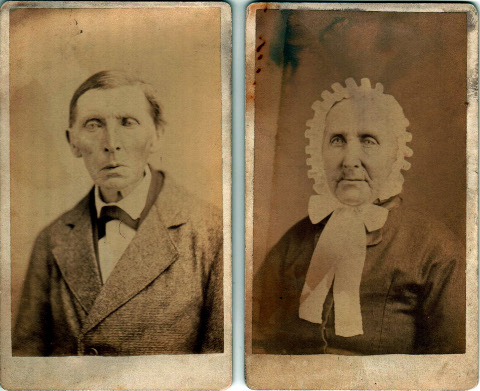 Hermann and Anna married Aug 20th, 1825 in Schledehausen. At that time, Hermann was still a farm hand. The first two children were born in Krevinghausen, the other in Hohenwalde 35a. At that time, Hermann was a tenant. Maria Engel, born Dec 20th, 1841. The family emigrated in 1854 and settled in Wood County, Ohio. They changed the spelling of their surname to Habbeler. Sheffield's Oldest and Wealthiest Citizens Passes Away. Henry Habbeler, the oldest and probably wealthiest citizen of Sheffield, died suddenly about noon on Sunday last ages 76 years. Mr. Habbeler had been in good health up to a few hours of his death and was engaged actiely last week in superintending repairs on the Habbeler block. Sunday about noon he informed his wife, who was ill, that there would be another patient when the physician called. He then went to the kitchen and called for a cup of coffee, which he drank. He then returned to the sitting room and taking a chair near a window. picked up the morning pater and began to read. In a few moments the cook heard a groan, and, going into the room found Mr. Habbeler in an unconscious condition. With great presence of mind, she did not notify his sick wife, but went to the telephone and summoned Dr. Blair and Mr. Will Habbeler, who responded at once, but Mr. Habbeler was dead before they reached the house. The funeral series took place Monday at the family residence, Re. W. J. Willis, of the Cumberland Presbyterian Chruch, officiating. There was a large attendance, including all of the city officials, and most of the business and professional men. The following named gentlemen actes as pall-bearers: Judge T. R. Roulhac, Capt. James R. Crown, Capt. J. W. Johnson, J. B. Spruance, C. B. Ashe and B. B. Cohen. After appropiate exercises the remains, followed by a large cortege, were taken to the railroad station and shipped to Toledo, O., for interment, accompanied by Mr. Will Habbeler, son of the deceased. Mr. Habbeler owned the land on which the city of Sheffield was located and was prominent in the development of the city. He owned some of the most valuable real estate in Sheffield and also owned property in Chicago and in Cleveland, O. It is a singular coincidence that much of the land on which the city of Cleeland is located was owned by the Habbeler family. Mr. Habbeler was a most excellent citizen and will be greatly missed. The Sheffield Standard, Saturday, October 19, 1901, p. 5. William Habbeler was born in Osnabruck, Hanover Germany June 1st, 1836, and died at his home in Genoa, October 25th, 1901. While yet a boy he came with his parents to America, spending the first couple of years of his life in the New World, clerking in a grocery store in New York City. It was here he received his first training in business affairs, which afterwards developed into an ability to conceive and execute enterprices, involving great interests, so successfully as to evidence his acumen and judgement. From New York he came to Pemberville, Ohio, where he spent some time on a farm with his parents; later the business instincts of the young man prompted him to seek a wider field for his aumbitions than the farm afforded, consequently in Toledo be took up again the work of clerking in a store. From Toledo he came to Genoa, in 1858, to assist his brother Henry in the merchant business he had established here, then becomming partner in a business that had grown to be extensie and profitable. In 1863 Mr. Habbeler became established in business by himself, selling supplies to farmers, timbermen and laborers operating a lime-plant, stave factory, etx. He bought for the railroad company thousands of dollar's worth of wood and timber every year, which not only afforded an outlet for the timber settlers were anxious to get rid of but was also a source of revenue to them. What with the abundance of timber surrounding Genoa and the inexhaustible supply of lime-stone underlying the surface ready to be manufactured into a commercial product, the village thried and its business men prospered. But with the passing ot the forests came the closing ot the kilns the dismantling of the mills and factories and a consequent lack of business and opportunity for musiness enterprises. So after having been identified with the growth and prosperity of Genoa in 1891 Mr. Habbeler established in Lake Ann, Mich,. an extensive timber plant to the management of which he gae his personal attention up to the time of his death. On February 15th, 1863, William Habbeler and Mary M. Cole were united in marriage and although his business interests were mainly in Michigan, Genoa continued to be his home as long as he lied. Two sons, William and George, that survied him, and who lie in Lake Ann will continue the business started by their father. Mr. Habbeler had a keen sence of right and never sought nor took advantage of others to further his own interests. Scrupulously honest and honorable in his methods and dealings he enjoyed the confidence of his acquaintances and associates. Friends from Oak Habor, Port Clinton, Pemberville, Toledo, Lake Ann and other places who came to pay their last tribute of respect at the funeral attest the largeness of his circle of friends and the esteem in which he was held. The funeral serices were held in the Christian chruch at Genoa, W. L. Stine pastor preching the sermon. Interment in the Woodville cemetery.